W0057: Great Platform (Building 1) The twin-stairs of Building 1 were built for a very specific purpose – to lead to two distinct temples. The concept and purpose of this design is best known from the Templo-Mayor, which featured prominently at the centre of the Aztec capital, Tenochtitlan, and was recorded by the early Spanish visitors and chroniclers who visited the city. Their reports describe a western facing twin-temple structure, with the northern temple painted blue and dedicated to Tlaloc, and the southern temple painted red and dedicated to Huitzilopochtli. 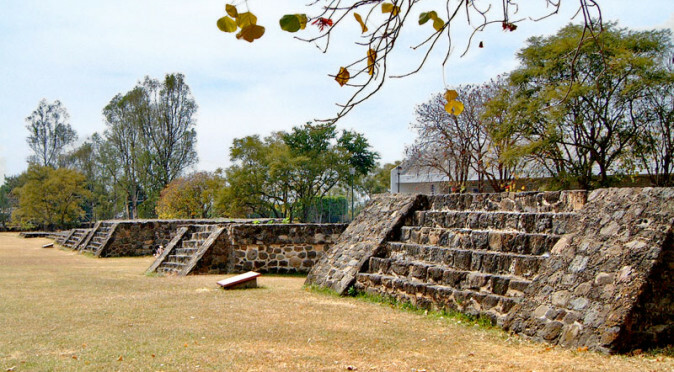 Upon the stairs of the Templo-Mayor, it is well documented that the Aztec sacrificed humans and discarded their headless corpses down the stairs – this included some early Spanish captives. 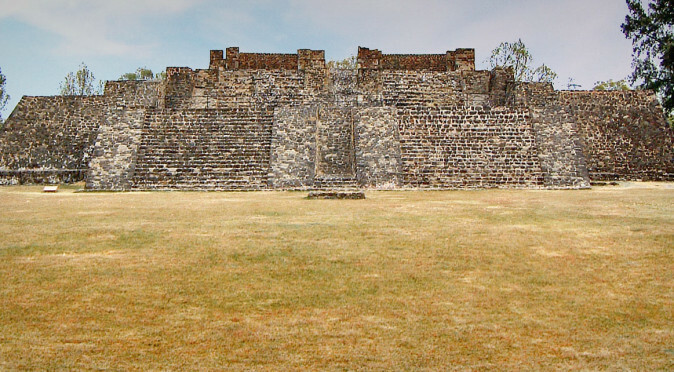 The obvious symmetry between Building 1 at Teopanzolco and the Templo-Mayor suggests that this temple would have been used in much the same way, and a cache of human remains found buried beneath Building 7 certainly supports the idea that the people here, thought to be the Tlahuica, were practising similar rituals. W0360: Central Veracruz – Tlaloc Tlaloc was an ancient rain deity who dates back to the earliest civilisations, in particular the Teotihuacano. His role was to bring water from the mountains to the agricultural zones, which he did through clouds that he gathered around the mountain-peaks. He is a common sight and can be identified by his goggles, which are often formed from coiled serpents, the fangs that protrude from his mouth, which are often curling serpents seeping from the corners of his mouth, and his long nose, which is thought to have been derived from a serpent. 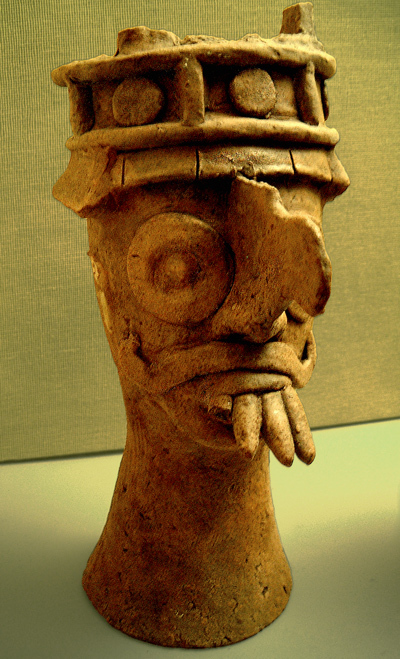 This iconography appears to be have been passed down from a common heritage to all the subsequent cultures of Mesoamerica and he is known by various names, but was always represented with these familiar features (he was known to the Maya as Chaac/Chac/Cuauc and to the Zapotec as Cicoyo). Aztec rituals dedicated to Tlaloc were known as Tozoztontli and took place in March and April at the beginning of the agricultural season to ensure an abundance of rainfall and a healthy crop. 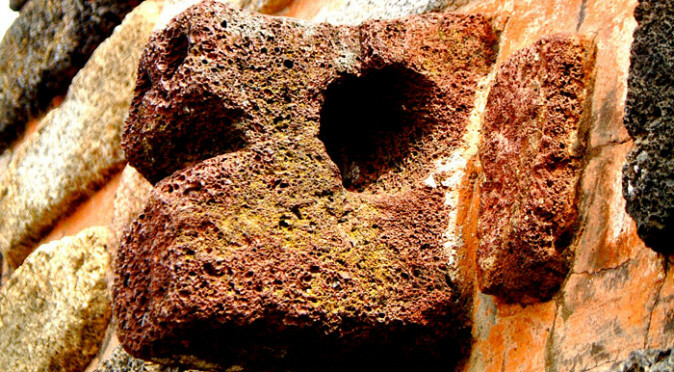 The Tozoztontli ceremonies are said to have included child sacrifice because the tears of a child were considered the purest form of water – and therefore the most befitting commodity to offer to the Rain God. Huitzilopochtli was the legendary warrior-leader of the Mexica (Aztec) who guided them from the fabled cave of Chicomostoc in their homelands of Aztlan. As a Divine Ancestor, he appeared to the Mexica priests and prophesied a vision of an eagle perched upon a nopal cactus, with a serpent grasped in its beak. He told them this would signal the end of their travels and should be the place where they build their capital. The Templo-Mayor was allegedly built upon this exact spot (and the prophesied vision can be seen on the Mexican flag today). For teaching them the art of honourable warriorship and leading them through countless wars, Huitzilopochtli became the patron deity of the Aztec (Mexica) and their God of War. He also inherited a role as protector of the sun, charged with escorting it across the sky and through the underworld at night. This development into the Sun God may have been an attempt by the Aztec’s to get their defeated subjects to honour their patron deity of war. The festival in Huitzilpochtli’s honour was called the Panquetzaliztli and was carried out in December, presumably to ensure the sun was fed sufficiently to resume its journey north for the summer. He was fed human blood, with captives of the Aztec conquests deemed the most befitting for the mighty God of War. W0046: Temples of Tlaloc and Huitzilopochtli The twin temples at Teopanzolco face west, just like the Templo-Mayor, and the temple to Huitzilopochtli is the southern side. This arrangement may have been designed to allow the sun to cast its beam into the temple at dusk and allow the priests to carry out a symbolic ceremony where they gave Huitzilopochtli offerings just before dusk to provide him with the strength he needed to guide the sun through the underworld. 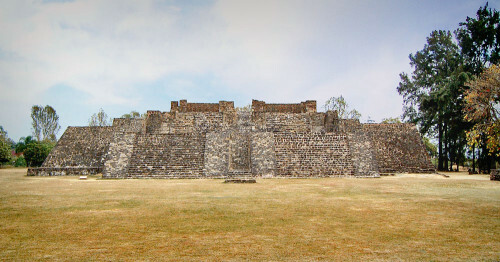 The twin-temple at Teopanzolco is thought to be an early example of, and possible precursor to, the design that went on to be used for the Templo-Mayor at Tenochtitlan. 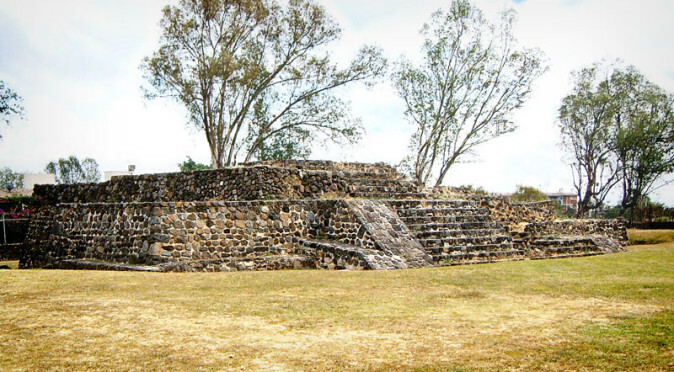 The purpose of the southern temple, which is dedicated to Huitzilopochlti, dictates that it must be Aztec (Mexica). 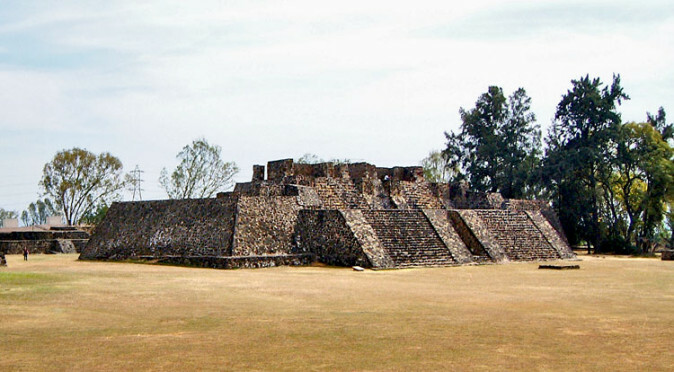 The state of the structure as seen today, demonstrates that the people of Teopanzolco (who must have been Aztec or under the guidance of the Aztec) were midway through developing it into a much larger structure when the site was abandoned, and so the older temple remains completely intact and visible from the top of Building 1, and yet it is encased almost entirely within the second structure that was being built (see the article on Building 1 for more information). 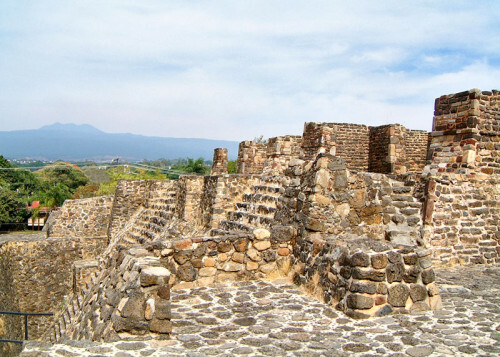 This could suggest the Mexica were here whilst they were still a semi-nomadic people and abandoned the temple because they had found their prophesied home of Tenochtitlan.